People suffering from chronic obstruction pulmonary disease (COPD) have a hard time breathing. It turns out, however, that playing the harmonica can be great therapy. The repeated pattern of breathing in and out through the instrument can help patients become aware of breathing patterns. That is the idea of the support class, COPD Harmonica Therapy. Nancy Kuster, the manager of cardiopulmonary services at OSF HealthCare St. Joseph Medical Center in Bloomington, Illinois, started the class as an innovative way for her patients to exercise their lungs. “It’s the only musical instrument where you not only have to draw in air, but you also have to blow out air to be able to create music. So it’s great therapy for people that have lung disease,” Kuster said. The group of budding musicians meets once a month. According to COPD patient Steve Peterson of Hudson, Illinois, the therapy is not only a boon for his health, but also comes with a side of entertainment. “It just helps you. It helps you breathe. And you know, it’s kind of fun,” Peterson said. Kuster agrees, saying the physical act of exercising the lungs isn’t the only benefit for these patients. And for those who aren’t musically inclined, Peterson says there is nothing to worry about. 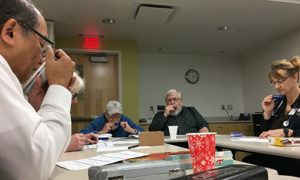 The free COPD Harmonica therapy group meets at 2 p.m. on the third Tuesday of each month at the Center for Healthy Lifestyles at OSF St. Joseph Medical Center in Bloomington, and at 2:30 p.m. on the third Thursday of each month at OSF HealthCare Saint James-John W. Albrecht Medical Center in Pontiac. Call (309) 661-5151 for more information. Harmonicas are supplied by the group, and you don’t need to have COPD to join. Learn more about lung and pulmonary services provided by OSF HealthCare.